I think we can all agree that trains are pretty big things; they can’t just disappear without trace, surely? But that’s exactly what happened yesterday to the 10.50am service from Milton Keynes to Manchester Piccadilly. 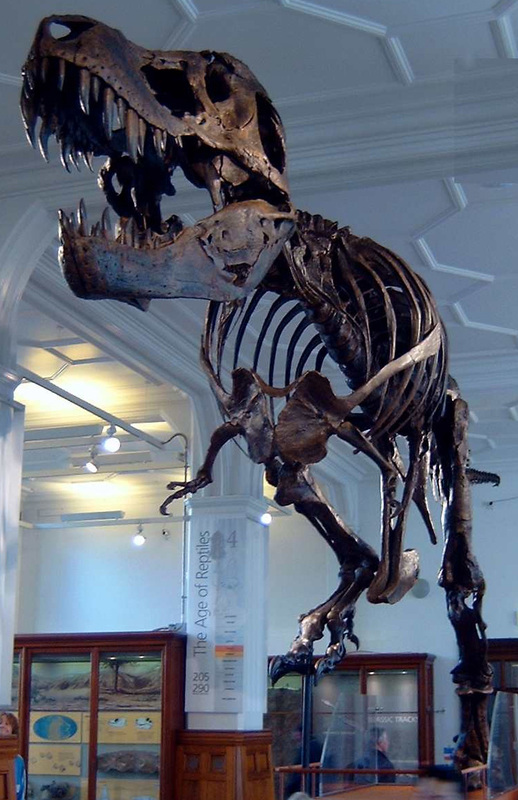 I was heading up with my colleague, Diane Johnson, to the Manchester Museum for the first full team meeting of the Catch a Shooting Star project (more about that in a bit). The 10.50 service was clearly marked on our very official looking tickets. We even had assigned seats! Eager to be on our way, we scrutinised the big electronic departures board, but the service had completely vanished! We asked a couple of nearby train officials for news, but neither of them seemed very clear about its fate. Delayed? “Probably.” Cancelled? “Perhaps.” “Keep an eye on the board,” was their best advice. The Virgin Trains official in the smart red coat said there were “problems!” “It may not have left Euston yet,” he added, but with little conviction. We joined a small group of bemused passengers on platform 6 and got into a conversation about virtual trains, quantum timetable effects and the possibility that the 10.50 might be on time in some parallel universe. Sadly, not this one. “How about getting the train to Crewe?” was one further possibility chipped in by the Virgin chap. Finally, we were told the 11.50 had left Euston on time and we should get that, our tickets would still be valid! Nothing further was spoken about the ill-fated 10.50 service. Happily the 11.50 arrived in Manchester Piccadilly on schedule and we jumped in a taxi and headed to the Manchester Museum, where we finally met up with the other team members: Curator of the Earth Science Collection David Gelsthorpe, and Katie Joy and Sarah Crowther from Manchester University. Although we had been exchanging emails about the project for quite some time this was the first full meeting of the team. 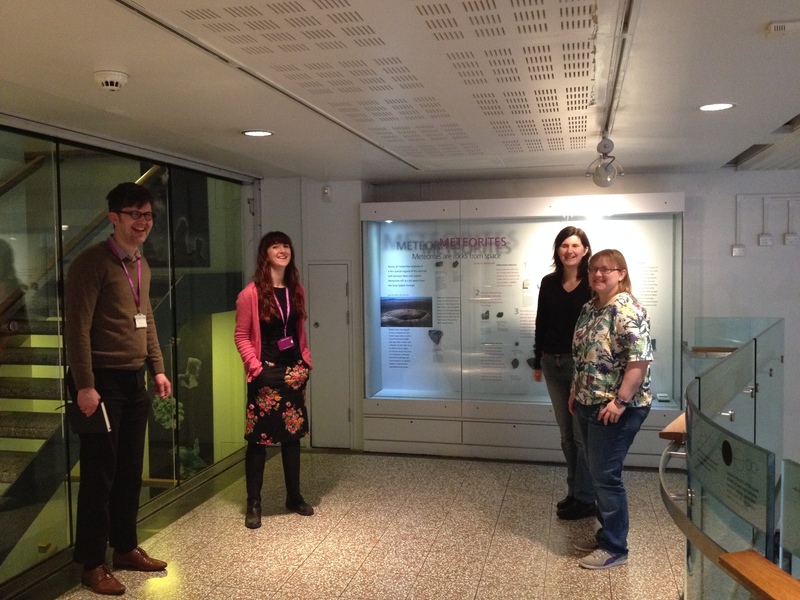 Members of the Catch A Shooting Star team in the meteorite gallery at the Manchester Museum. From left to right: David Gelsthorpe, Katie Joy, Sarah Crowther and Diane Johnson. So what is Catch a Shooting Star all about? The idea behind the project grew out of our experience using a set of real meteorites when giving talks to schools, clubs and other non-specialist audiences. Videos and images are great, but there is nothing that can match the experience of being able to handle genuine extraterrestrial samples. A flavour of this approach is given on our Open Meteorites website. So Catch a Shooting Star aims to build an exhibit at the Manchester Museum that will allow visitors to handle and examine real space rocks. That’s not to say there won’t also be some pretty amazing video and interactive displays too! At the inaugural meeting yesterday we went over the details of the project, looking at the practicalities involved in developing the exhibit and reviewing progress so far. We had a look at the Museum’s existing meteorite display and discussed how the new exhibit could be incorporated to enhance the visitor experience. Lots of photos were taken and we also got out a tape measure and made a rough plan of how things might all fit together. We also looked at other relevant exhibits in the Museum, including the amazing sample of the Cretaceous boundary layer, which contains the iridium anomaly, formed as a result of the dinosaur-killing asteroid impact. The Manchester Museum also has an inspiring temporary exhibition about Siberia that includes a very nice iron meteorite specimen. It provided a good excuse to visit the exhibition and see at firsthand how static display materials and video installations can be put together in a coherent and exciting way. Finally, we also did a bit of brain storming and came up with a couple of very cool, wow-factor ideas for our own exhibit. More about that in future posts. At the end of the meeting we said goodbye to David and then Diane and I headed over with Katie and Sarah to their labs at Manchester University’s School of Earth, Atmospheric and Environmental Science. We had a coffee and some excellent chocolate cake, followed by a quick look at their very cool kit. Particularly impressive were Torsten Henkel’s two time-of-flight secondary ion mass spectrometers, one of which he uses C60 to analyze organic material in the matrix of carbonaceous chondrites. 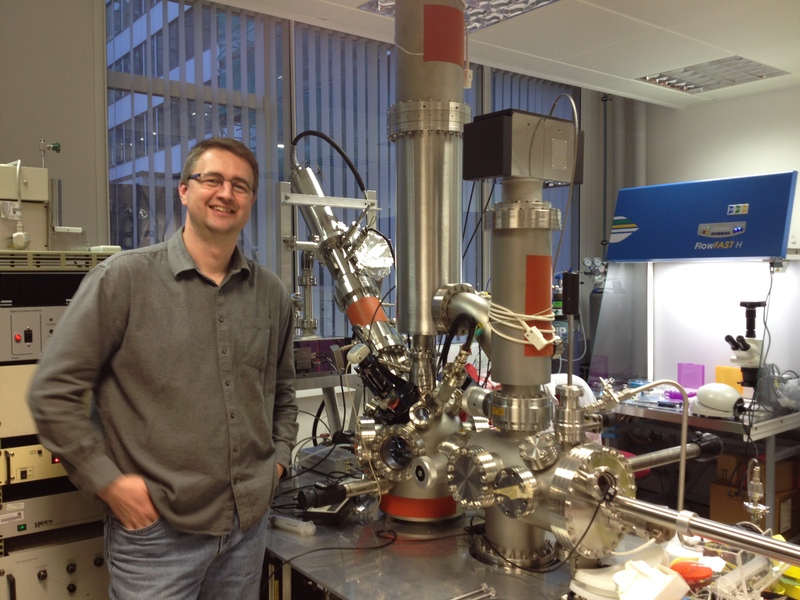 Torsten Henkel stands next to his time-of-flight secondary ion mass spectrometer, which he uses to analyse organic material in carbonaceous chondrites. We took a taxi back to the station and caught the 5.15pm to Milton Keynes. No problems this time with the train. As we headed south we were both feeling really encouraged by how things had gone. The Manchester Museum has provided a very nice space in which to develop the exhibit. We also generated some great ideas about how to make this a very special project. 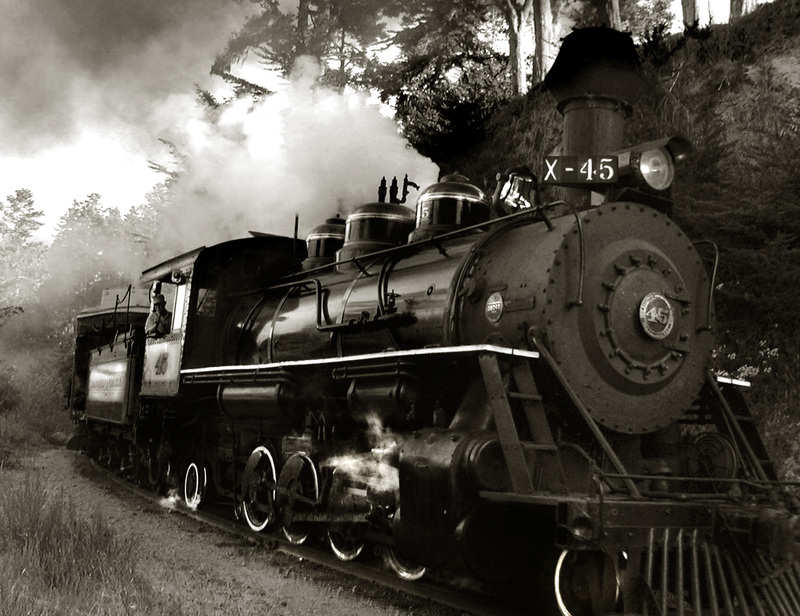 So like the giant locomotives of old, we now have a full head of steam and some real momentum. Keep watching this space for further updates. January 28, 2015 in Meetings.